Q: Hey Ellie, why do you hate Facebook so much? A: Well, here's one of about a billion reason! On Thursday night, I went dancing with some friends at a club in Hollywood. A photographer there got some fun shots of us dancing that he showed me. He gave me his card, saying to find him on Facebook and he'd send them to me. So let me get this straight. 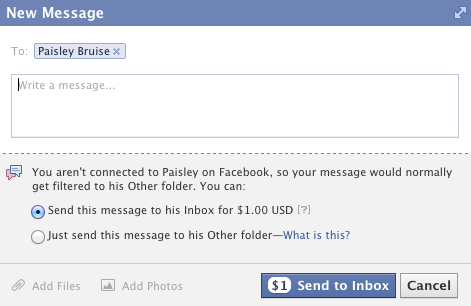 To just send a message to someone on Facebook now, with the same priority level as everyone else, costs money? Say it ain't so, Facebook mission statement! Because nothing says social connectivity like putting a paywall between people. Never change, Facebook. LOLs for days.